The Humans cleaned up at the 2016 Tony Awards, winning Best Play and three other honors. Hailed by The New York Times as "piercingly funny and bruisingly sad," Stephen Karam's singular new play makes its St. Louis premiere at The Repertory Theatre of St. Louis, February 7 – March 4. The Rep's Augustin Family Artistic Director Steven Woolf will direct. 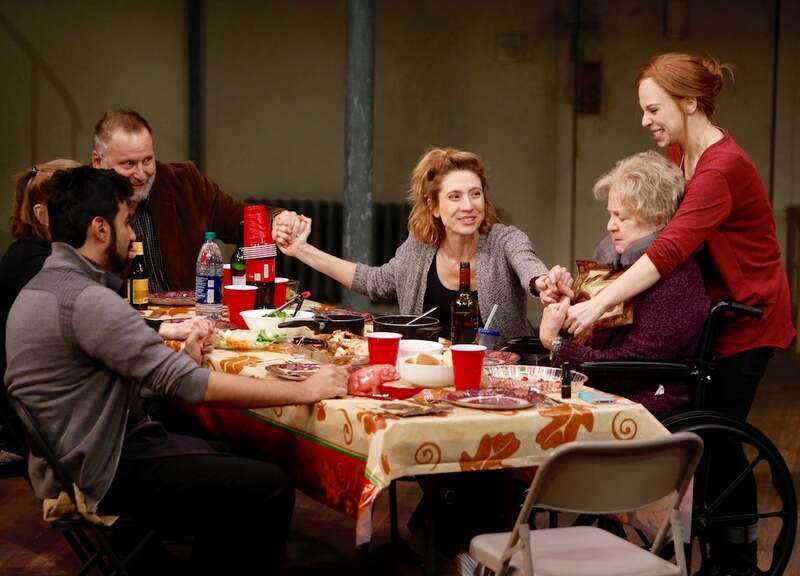 Three generations of the Blake family have gathered in a dingy New York City apartment for Thanksgiving. Everyone’s trying to make the best of it, but life’s little indignities are piling up. With a mixture of eerie pathos and dark humor, Karam’s vivid family portrait is nothing but honest. The cast is packed with familiar Rep performers, starting with Brian Dykstra as Blake family patriarch, Erik. Dykstra gave muscular lead performances in All the Way (2015) and Red (2011), both also directed by Woolf. Carol Schultz (The Lion in Winter, 2016) returns for her 16th Rep production as Erik's wife, Deirdre. Another Rep favorite, Darrie Lawrence (Mothers and Sons, 2016) will appear in her 15th Rep production as Erik's mother, Momo. Representing the youngest generation of the Blake clan are daughters Aimee (Kathleen Wise, of 2017's The Curious Incident of the Dog in the Night-Time) and Brigid (Lauren Marcus). Fajer Kaisi rounds out the cast as Brigid's boyfriend, Richard. The creative team includes scenic designer Gianni Downs (Molly's Hammer, 2016), costume designer Dorothy Marshall Englis (The Marvelous Wonderettes, currently on stage), lighting designer Rob Denton (A Christmas Carol, 2016) and sound designer Rusty Wandall (The Marvelous Wonderettes). Tickets to The Rep's production of The Humans are currently on sale and can be purchased online here, by calling the Box Office at 314-968-4925 or visiting the Loretto-Hilton Center at 130 Edgar Road (on the campus of Webster University). Ticket prices range from $18.50 to $89. Show times are Tuesdays, select Wednesdays and select Sundays at 7 p.m.; Thursdays, Fridays and select Saturdays at 8 p.m. Matinee performances are select Wednesdays at 1:30 p.m., Saturdays at 4 p.m. and Sundays at 2 p.m.